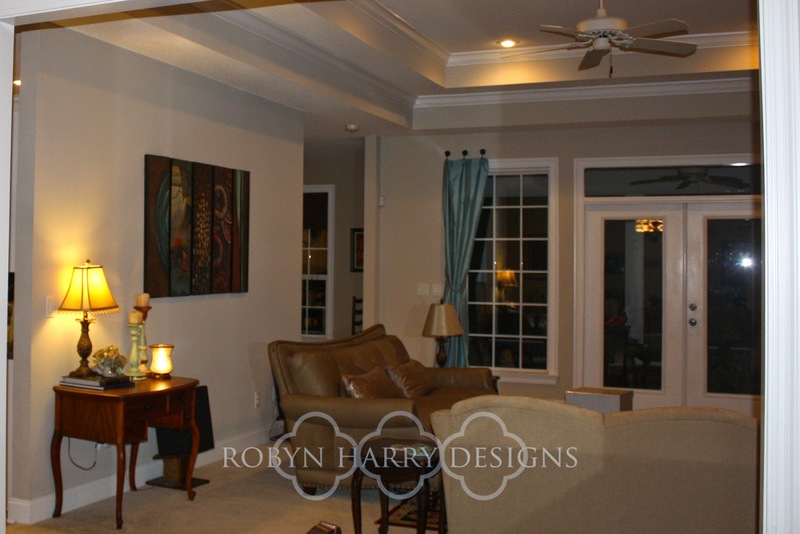 robyn's reverie: Room Refresh | Cozying up the living room. Room Refresh | Cozying up the living room. Thank you so much for joining me for the last reveal of this 3 part room refresh! I'm excited to share with you some of the best changes we made. 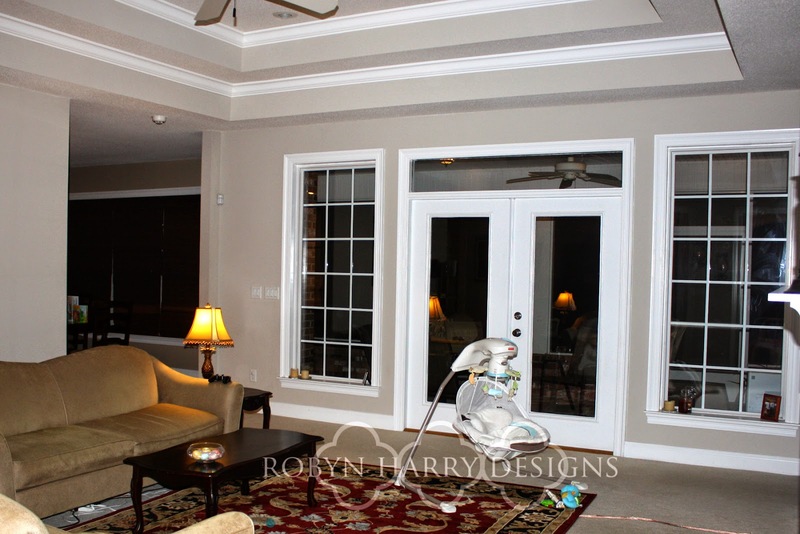 The biggest challenge many people face when decorating a room is deciding how to dress the windows. This proved especially true in my client's living room. 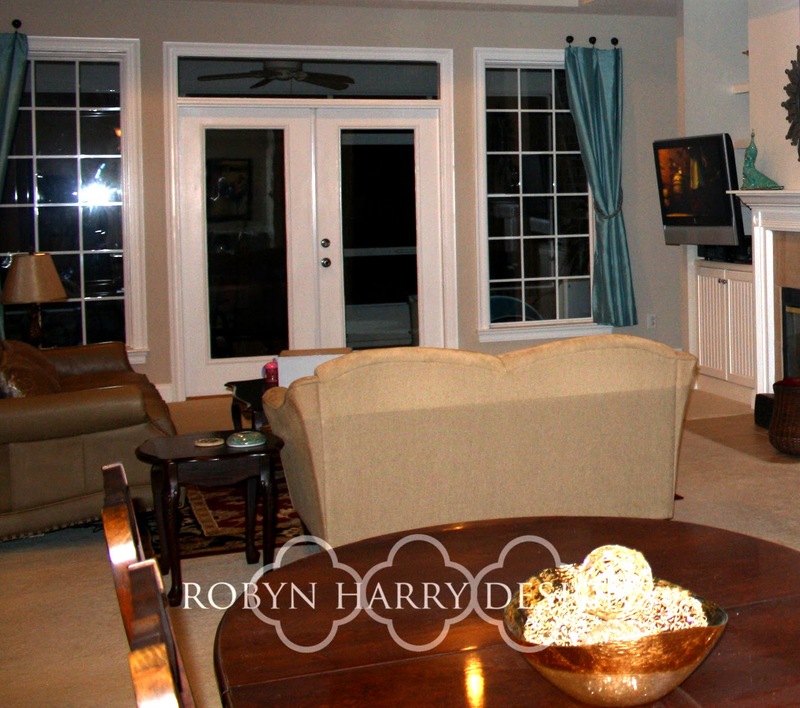 She considered hanging curtains on the windows on either side of the french doors. The problem is the window casings are too close to the door frame. She also considered hanging a curtain on a very (very!) long rod spanning the entire width of the windows and the door. That is definitely a viable option, however I think it would have given the room a more formal feel than my client desired. 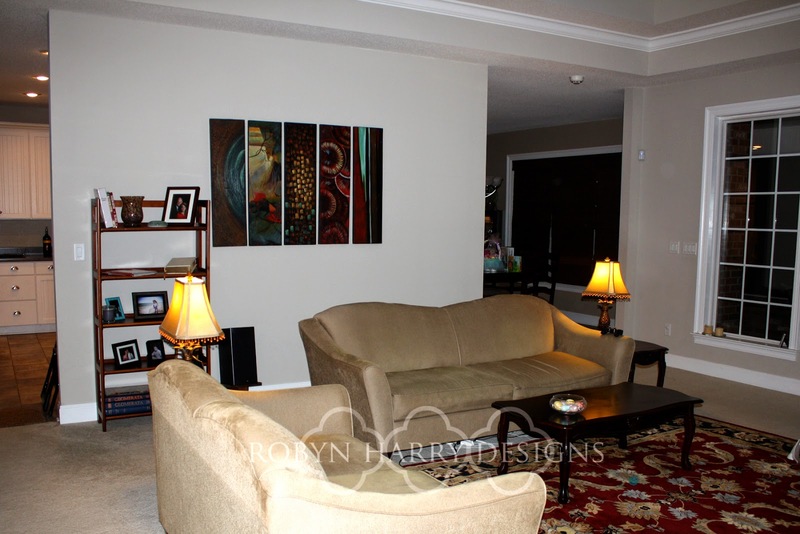 Right away you can see the difference window treatments make. The room feels warmer and much more inviting. Again we used tiebacks in unconventional way. 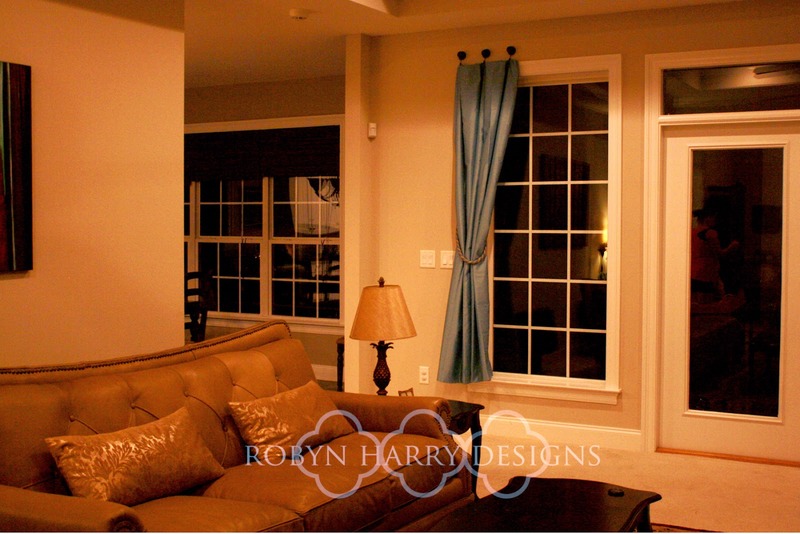 Because of how close the window frame is to the door casing, a standard curtain rod would look out of place. The finials would have to be near nonexistent or they would jut over the door frame. I truly feel the look would have been cluttered and disorganized. In contrast, the treatment we went with looks chic and streamlined. It adds a great frame to the set of windows. We replaced the shelves with a desk that was not currently being used. 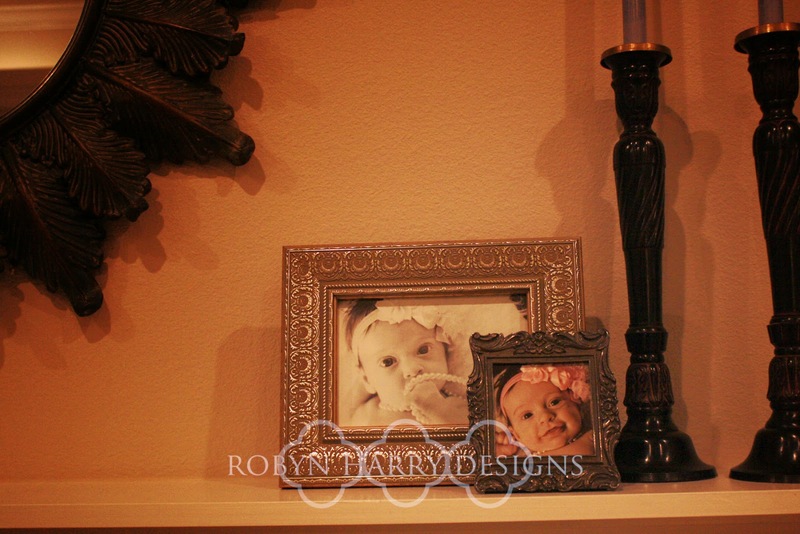 I moved one of the lamps to the desk and added a few accent pieces that she already had. 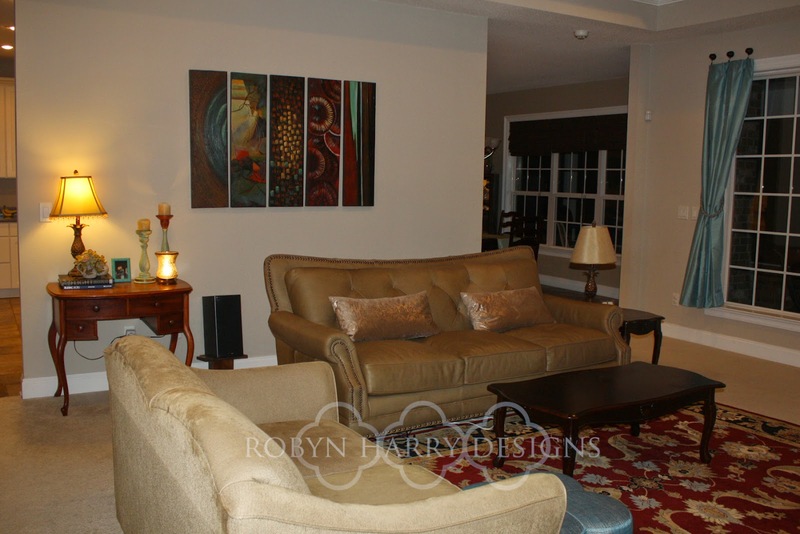 My client wasn't overly in love with her lamps in the living room. I thought they were pretty and fit well with her space. Together, we realized what she didn't love about them were the shades. They are rectangular and she felt they seemed out of place in the middle of the room on the end tables. Moving one of them to the desk and against a wall helped to create a more cohesive look. I suggested she buy a round lamp shade for the lamp that was to remain in the middle of the room. Finally, we come to the fireplace. This is, without a doubt the focal point of the room. 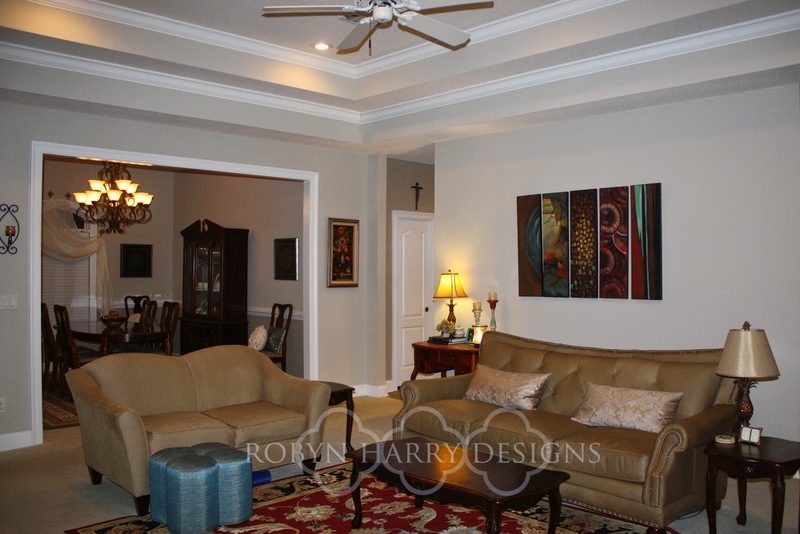 My client had decide before we met that she was going to have floating shelves installed. 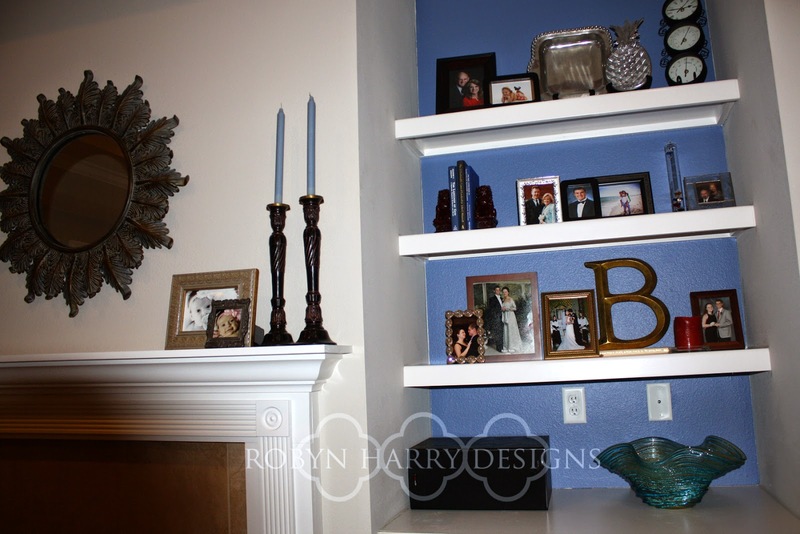 Also on her own, she decided to paint the walls behind the shelves in a gorgeous blue. Many of her accent pieces are blues. 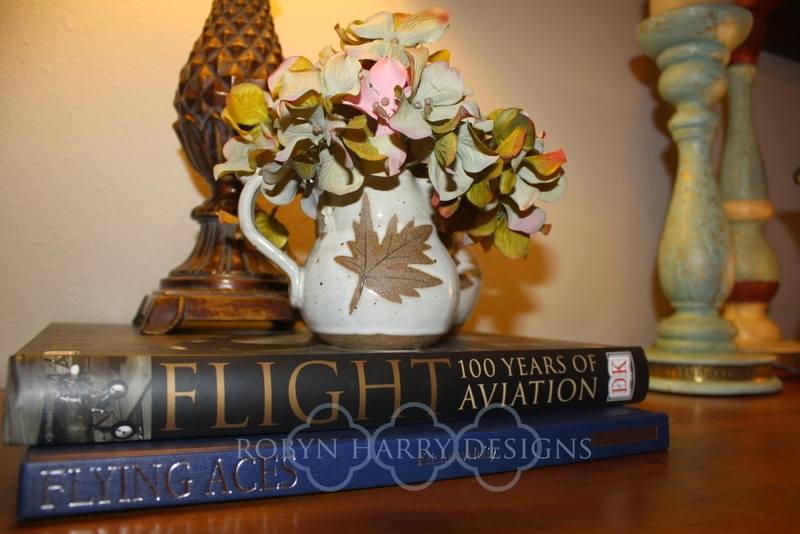 This is such an inexpensive way to make a large impact on a room. The blue really makes the shelves pop. Every single thing on those shelves is something my client already owned. It just shows you don't have to invest a lot of money to make your home a haven. Sometimes all you need is a second eye to help you arrange everything in complimentary way. 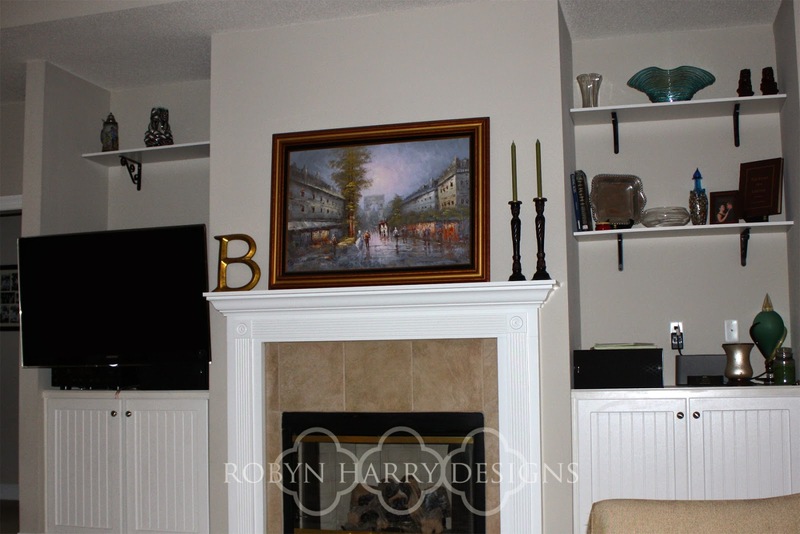 Above the mantle, we placed an amazing sunburst mirror that my client picked up on her own when we began working together. It's a perfect fit for her style and the space. 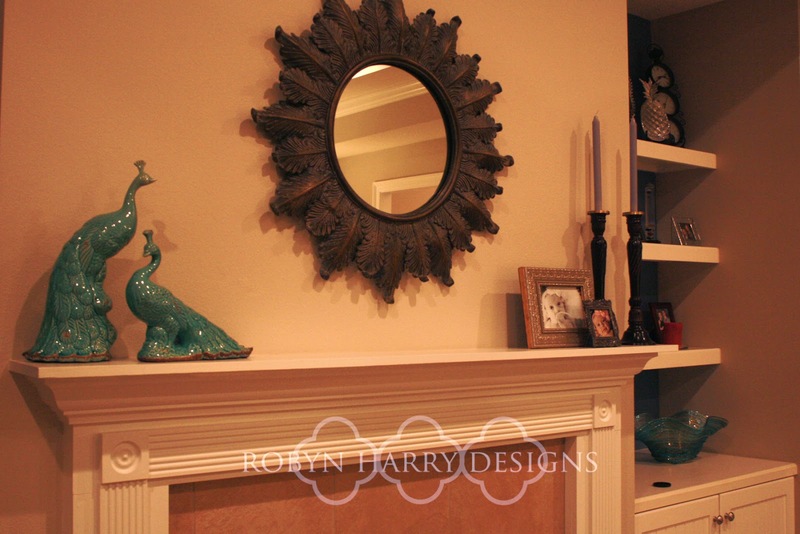 On either side of the mirror are simple groupings of beautiful pieces already owned by my client. 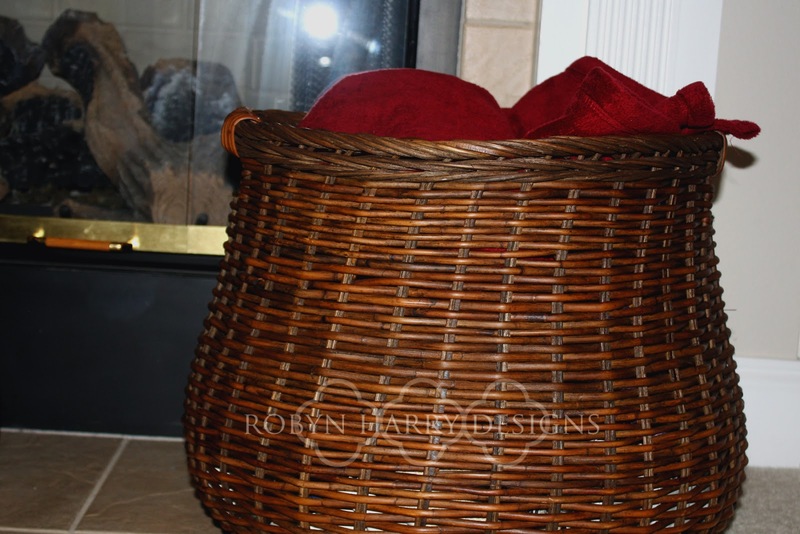 One last thing I LOVE to do is to find a large basket to keep blankets in. It adds "something" to a place in the room you feel may be lacking. It's instant coziness and warmth. Both literally and figuratively. I have immensely enjoyed working with this client. I felt together we came up with perfect solutions for her home. I know she feels more relaxed and at ease in her own space now. I'd even dare to say it is now her haven.